I started playing tennis. I always wanted to play tennis and didn't really get a great opportunity to until now. When I was in Japan this past June, I watched a special program on TV about a Japanese tennis player, Kimiko Date. She was ranked at 4th in the world before, and after 12 years of being retired from playing tennis, she came back to play professionally again this year. She said that she just wanted to play tennis again, the sport that she absolutely loves. Oh, she was glowing with happiness. What a blessing to be able to do what you most love. I must admit that I was a little jealous of her and wanted to feel like what she was experiencing. Then, my decision was simply to play tennis! 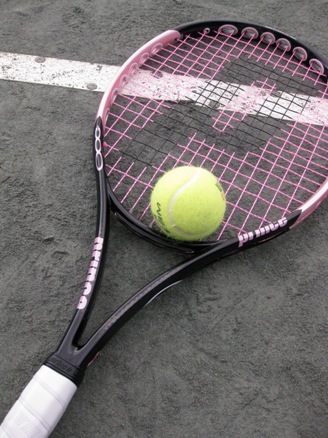 So, I bought a new racket (which is pink & so cute!) and a pair of tennis shoes. The dumb part was that I missed the first lesson last week. I totally was confused and had the wrong start date. So I finally made it to the tennis lesson today and had a grand time. I loved it and am so thrilled that I get to do this every week.